Over the centuries the scourge of anti-semitism has done an effective job of robbing Christians of their heritage as Passover People. How many Christians today understand what Paul wrote? That whether Jew or Gentile, if you belong to Christ you are Abraham’s children? How many understand their role in the biblical narrative, their common scriptural roots and shared biblical standards? 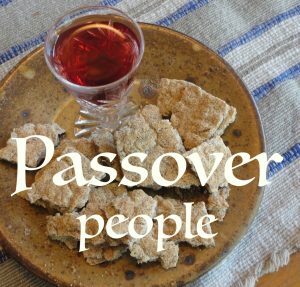 But most importantly, how many grasp their new covenant relationship with the Father as Passover People with a glorious destiny? Jeremiah prophesied of the time that Paul longed for – a time when Israel would be saved along with all the gentiles that God would graft into the nation. The prophet and the nation were facing a bleak future. Israel had already been taken captive by the Assyrians and Judah was being besieged by the Babylonians. But God revealed that there would be a time when the fortunes of Israel and Judah would be restored. At that time Hebrew would once again be spoken in the land of promise. This promise gave Jeremiah hope for the future of the Passover people. There were partial fulfillments in the time of Ezra, and again in the last century. When Israel was revived as a nation and a ‘dead language’ was resurrected once again. But the ultimate fulfillment will come when God regathers Israel and Judah and renews the covenant with them. At that time the Lord God will forgive their wickedness. He will write his word on their hearts and his law will be internalized. When will these things occur? John describes this time in Revelation. Then the Word of God, the King of Kings, will come to judge the world, with robes dipped in blood. But this will not be his first coming. Originally, he came as the Word of God, the creator and life-bringer. Later he willingly sacrificed himself and shed his blood to cleanse people of their sins. And it was in the Passover, that Jesus provided us an example and taught his disciples to honour this sacrifice with the symbols of bread and wine. Like the original Passover lamb whose blood on the door post protected and delivered the first born of Israel. So, the blood of the Word of God was shed as a sacrifice. And this sacrifice would give life and liberty to those who would walk in a new covenant relationship with God. The Word of God, the Messiah, became the lamb of God, the Passover lamb, to all who would become his Passover people. This new covenant, had been embraced by Abraham who understood the need for a Messiah and had a loving relationship with God. In the time of Jesus of Nazareth the covenant was not totally “new.” Rather, it was ‘renewed’ for all those who would embrace Jesus as their Messiah. The new covenant was for those who would repent of their sins, be baptized, receive God’s spirit, and begin to imitate Christ as their master. This was ‘new’ but it had very old roots. The nation of Israel, God’s Passover people, were to become Holy as God is Holy, and this had not changed. The standards of holiness had not changed. Long after the Messiah’s sacrifice Paul and Peter admonished believers to become Holy as God is Holy. Why? In order to fulfill God’s purpose. The Passover is still the time to reflect on God’s deliverance and our duty to purify ourselves. We must become Holy, so we can accomplish God’s work in our lives. We cannot be a light to the world if we are wallowing in darkness and sin. So our Passover, Jesus Christ the Word of God, has washed away all the impurities so we can be a light to others. And now, we must live obedient lives, empowered by God’s spirit to be holy and exhibit godly character and moral courage. It does not matter whether we are Jew or Gentile. Our Passover lamb has made us all Passover people so we can please God. Every year our Passover pilgrimage begins with a profound understanding of the Word of God and his sacrifice, and a repentant heart so we can follow in his footsteps.